There are changes coming to Disney World in a major way when we are referring to Disney's Hollywood Studios theme park. One area of major change is the new Toy Story Land that will provide 11 acres of themed entertainment featuring your favorite Toy Story Characters. In Toy Story Land, you’ll find yourself shrunk to the size of a toy to explore the world of Andy’s backyard with your favorite Toy Story characters, including Woody and Buzz. 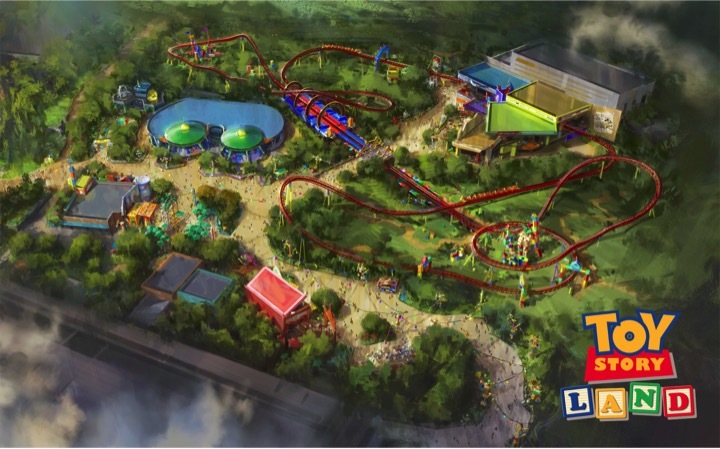 There are two new themed attractions being developed for Toy Story Land. The first – Slinky Dog Dash – will be a family coaster attraction you’ll want to ride again and again. The attraction features a coaster track that Andy has built all over his backyard using his Mega Coaster Play Kit, but as you know, he has a pretty amazing imagination, so he’s combined it with some of his other toys, according to Imagineer Kathy Mangum. Take a look at a concept video of Slinky Dog Dash that Kathy shared earlier. On Slinky Dog Dash, you will zip, dodge and dash around many turns and drops that Andy has created to really make Slinky and his coils stretch to his limits. As you rotate around the toy planets and satellites as part of the game, you’ll swirl to the beat of fun “Space Jazz” music developed just for this experience, Mangum said. The music, the lighting, and the sound effects will add to the flurry of your adventure while “The Claw” looms ominously over you. Also today, Mangum shared an update that beginning Memorial Day weekend, even more guests will be able to experience Toy Story Mania with the addition of a third track. 0 comments to "Inside Look at NEW Toy Story Land Attractions Coming to Disney's Hollywood Studios"